Definition at line 32 of file CQFunctionDM.h. Definition at line 22 of file CQFunctionDM.cpp. Definition at line 32 of file CQFunctionDM.cpp. 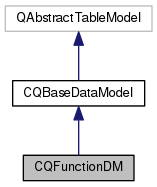 Definition at line 72 of file CQFunctionDM.cpp. References COL_MATH_DESC_FUNCTIONS, COL_NAME_FUNCTIONS, COL_ROW_NUMBER, COL_SBML_ID_FUNCTIONS, COL_TYPE_FUNCTIONS, flags(), FROM_UTF8, CCopasiRootContainer::getFunctionList(), CEvaluationTree::getInfix(), CCopasiObject::getObjectName(), CEvaluationTree::getType(), CQBaseDataModel::isDefaultRow(), CFunctionDB::loadedFunctions(), rowCount(), and CEvaluationTree::TypeName. Definition at line 37 of file CQFunctionDM.cpp. References COL_NAME_FUNCTIONS, CQBaseDataModel::isDefaultRow(), and isFunctionReadOnly(). Definition at line 129 of file CQFunctionDM.cpp. References COL_MATH_DESC_FUNCTIONS, COL_NAME_FUNCTIONS, COL_ROW_NUMBER, COL_SBML_ID_FUNCTIONS, and COL_TYPE_FUNCTIONS. Definition at line 219 of file CQFunctionDM.cpp. References CFunctionDB::add(), ListViews::ADD, COL_NAME_FUNCTIONS, CQBaseDataModel::createNewName(), ListViews::FUNCTION, CCopasiRootContainer::getFunctionList(), CFunction::getKey(), CQBaseDataModel::notifyGUI(), and TO_UTF8. Definition at line 51 of file CQFunctionDM.cpp. References CEvaluationTree::Expression, CEvaluationTree::Function, CCopasiRootContainer::getFunctionList(), CEvaluationTree::getType(), CFunctionDB::loadedFunctions(), CEvaluationTree::MassAction, CEvaluationTree::MathExpression, CEvaluationTree::PreDefined, and CEvaluationTree::UserDefined. Referenced by flags(), and removeRows(). Definition at line 279 of file CQFunctionDM.cpp. References C_INVALID_INDEX, CQMessageBox::confirmDelete(), FROM_UTF8, CCopasiRootContainer::getDatamodelList(), CEvaluationTree::getDeletedObjects(), CCopasiRootContainer::getFunctionList(), CCopasiDataModel::getModel(), CCopasiObject::getObjectName(), CQBaseDataModel::isDefaultRow(), CFunctionDB::loadedFunctions(), and CQBaseDataModel::removeRow(). Definition at line 235 of file CQFunctionDM.cpp. References CCopasiVector< T >::begin(), ListViews::DELETE, ListViews::FUNCTION, CCopasiRootContainer::getFunctionList(), isFunctionReadOnly(), CFunctionDB::loadedFunctions(), CQBaseDataModel::notifyGUI(), and CFunctionDB::removeFunction(). Definition at line 28 of file CQFunctionDM.cpp. References CCopasiRootContainer::getFunctionList(), CFunctionDB::loadedFunctions(), and CCopasiVector< T >::size(). Referenced by data(), and CQFunctionsWidget::deleteSelectedFunctions(). Definition at line 157 of file CQFunctionDM.cpp. References ListViews::CHANGE, COL_MATH_DESC_FUNCTIONS, COL_NAME_FUNCTIONS, COL_TYPE_FUNCTIONS, CQBaseDataModel::createNewName(), data(), FROM_UTF8, ListViews::FUNCTION, CCopasiRootContainer::getFunctionList(), CCopasiObject::getKey(), CCopasiObject::getObjectName(), CQMessageBox::information(), CQBaseDataModel::insertRow(), CQBaseDataModel::isDefaultRow(), CFunctionDB::loadedFunctions(), CQBaseDataModel::notifyGUI(), CEvaluationTree::setInfix(), CCopasiObject::setObjectName(), and TO_UTF8.